David Cameron is reacting with short term fixes as our country suffers the worst floods in 200 years. But together we can get him to face down the climate deniers, and agree a way to stop disastrous deluges happening more and more often. Energy Secretary Ed Davey just warned that fringes of the Tory Party and UKIP are trying everything to trash the scientific and political consensus on climate change. These guys have their heads in a sandbag: leading scientists agree these floods are climate-related. Their nutty attacks are dangerously timed -- right now, Europe is setting joint long-term goals to cut carbon pollution. And only if the EU sets the right benchmark can we get the rest of the world to aim high. The UK is sinking, and instead of dealing with the root causes of the flooding crisis, politicians are stuck in a blame-game which ignores the hard facts: climate change is happening, and we must act fast to protect ourselves from it. As Ed Davey’s warned this week, a “diabolical cocktail" of nimbyism, denial of science and fear of Europe from politicians on the right is stalling government action, even though 95% of the world’s leading scientists agree that climate change is real and human caused. 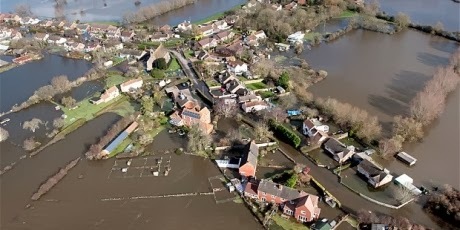 It’s nuts to cover floodplains in concrete and cut the Environment Agency’s budget to protect us from flooding. But focusing on flood prevention and coping is only half of the solution -- we need to cut carbon emissions to stop these extreme weather events getting worse, and happening more often. That’s why a strong European target is so important, and heads of state are negotiating right now before their key summit next month. Now is our chance. These floods have created enough public anger to put Cameron on the spot and demand he turn today’s floody nightmare into a cleaner, drier future for us all. Let’s call on Cameron to keep his promises and be a climate champion -- sign now before it’s too late! Last month over 225,000 sent messages to the European Commission calling on them to support a target to halve Europe’s carbon pollution by 2030. The Commission proposal fell short, but now it’s up to heads of state to decide. If we can use the energy behind the floods to refocus on Cameron on climate change, it could bring the breakthrough we and the world need. New Homes Have High Risk for MoldAre You Covered?